Adventure begins at Gatorland – the alligator capital of the world! 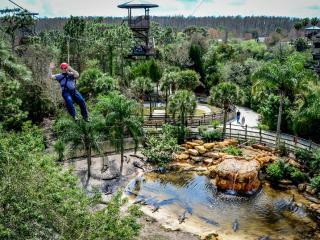 This amazing 110-acre alligator theme park and a wildlife preserve is situated just minutes away from Walt Disney World and is a great alternative to the larger Orlando theme parks. Your Gatorland tickets give you entrance through the park’s gaping gator mouth into one of Florida’s oldest and most unusual attractions. Experience some of the most incredible animal shows in Orlando including: Incredible display of huge alligators and crocodiles. A breeding marsh with boardwalk and observation tower. Wrestling alligators!! Gator wranglers catch an alligator by hand and climb onto the snapping animal's back to point out survival features to the audience. After performing dramatic stunts the alligator is rolled over and put to sleep...then woken by a tickle! The Gator Jumparoo Show: Marvel as some of the largest alligators in the world leap four to five feet out of the water to retrieve food in this famous one-of-a-kind show. Fascinating creatures from around the globe at the Up-close Animal Encounters Show, including some of the most dangerous snakes alive. Plus one-of-a-kind reptilian shows, petting zoo, aviary, swamp walk, educational programs and much, much more. 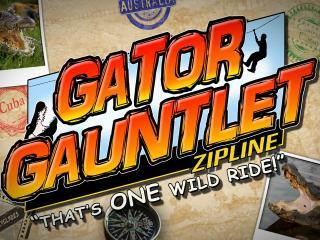 American Attractions will issue you with an open-dated Gatorland One-Day Ticket Voucher. 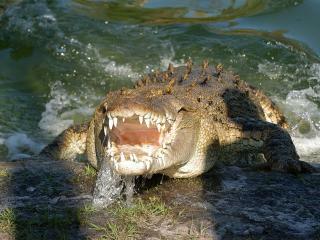 Your voucher can be redeemed at any time during your holiday for a full day’s admission to Gatorland. 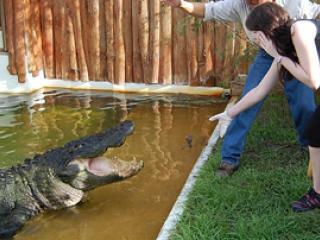 Gatorland is open daily, rain or shine, from 9:00 AM to 6:00 PM for the fun and enjoyment of your whole family. The park is well placed between Orlando and Kissimmee on the South Orange Blossom Trail. 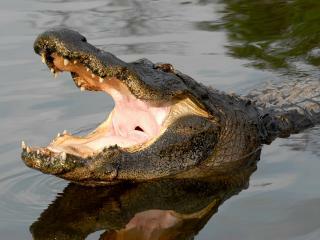 Combine your visit to Gatorland with a thrilling airboat ride at a Central Florida airboat farm. As you whiz across the water try to spot some of the local Floridian wildlife and absorb the natural beauty that is not really seen in Orlando. Afterwards, head to Gatorland where you can enjoy all the shows and exhibits that are detailed in the description above. This popular tour operates every Monday and includes pick-ups from central meeting points in the International Drive, Lake Buena Vista, Kissimmee and Walt Disney World areas. The pick-up locations are arranged so that you do not need to travel too far to your nearest point. The actual location will be given at the time of booking when you advise us of your hotel. In the event that you do not have your hotel information available at the time of booking, you will be advised of your pick-up point when you call to reconfirm your tour in resort.